Makes enough for 2 French baguette loaves. Mix all ingredients in a large bowl. Use your fingers to really work it together. It will create a paste-like texture. Can be used right away or refrigerated for up to a week, frozen for up to three months. Preheat broiler (or oven to 500F). Slice a French baguette into thin slices, about 1/2" each. Place slices onto a baking sheet. Spread about 1/2 tablespoon of cheese mixture onto each slice. Broil for 1-2 minutes, watch carefully! It only takes a minutes. Edges of the bread should be browned and the cheese should be bubbly. 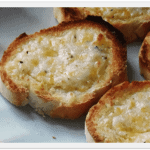 This recipe for 7 Cheese Garlic Spread was printed from AmandasCookin.com - https://amandascookin.com/7-cheese-garlic-spread/ and can only be printed for education or personal use.